County and city officials gathered Tuesday to celebrate the $500,000 donation by the Wells Fargo Foundation. COATESVILLE — The Chester County Economic Development Foundation in partnership with the Coatesville Area Partners for Progress and the Coatesville 2nd Century Alliance has announced that the Wells Fargo Regional Foundation is contributing $500,000 toward the Coatesville Growing Greater Neighborhood Revitalization initiative. 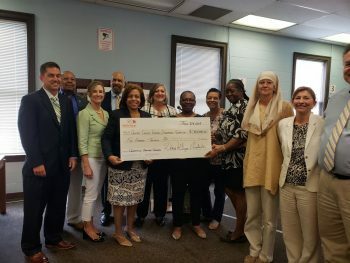 These funds will be used to implement neighborhood strengthening strategies that were developed by the residents of Coatesville during the year-long planning phase of this initiative, also underwritten by the Wells Fargo Regional Foundation. Throughout 2016 and 2017, public meetings, stakeholder interviews, and more than 300 one-to-one resident surveys were conducted, all which unearthed four key focus areas: Youth Empowerment, Public Safety, Jobs & Economic Opportunity, and Resident Engagement. Task teams, comprised of Coatesville residents and topic professionals were charged with developing creative strategies to improve conditions in the key topics. With strategies in place, an application was made to the Wells Fargo Regional Foundation to financially support a staff position that will work with City residents toward their implementation. Additionally, more than 20 community and County organizations and entities have committed to partnering in the endeavor. “The Wells Fargo Regional Foundation shares our vision of strong and stable neighborhoods. They believe as we do that neighbors working together can ensure everyone will benefit from the City’s economic prosperity,” said Regina Lewis, President of Coatesville Area Partners for Progress. “Our Board saw the tremendous potential that exists with the initiative and we wanted to be a partner in Coatesville’s future,” stated Denise McGregor Armbrister, Executive Director of the Wells Fargo Regional Foundation. “We couldn’t be more excited about the prospects of this partnership. The Chester County Economic Development Council and its Foundation are deeply committed to the success of this program and the long term economic revitalization of our only City,” noted Gary Smith, President and CEO of the Chester County Economic Development Council. Established in 1998, the Wells Fargo Regional Foundation is a foundation focused on neighborhood revitalization initiatives in New Jersey, Delaware, and eastern Pennsylvania. For more information, please visit www.WellsFargo.com/about/regional-foundation. The Chester County Economic Development Council (CCEDC) is a private, non-governmental entity that promotes a competitive edge for existing and new businesses by providing proven financial solutions; cultivating workforce talent; leveraging business partnerships; and fostering entrepreneurial collaboration for more than 50 years. CCEDC services improve the business community and enhance the quality of life in Chester County and the region. For more information, please visit www.ccedcpa.com. Coatesville Area Partners for Progress is a private, non-profit entity comprised of vested community leaders providing more than twenty years of community and economic development support to the City of Coatesville. 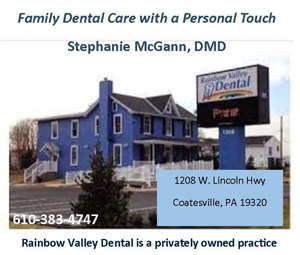 In 2015 it established the Coatesville 2nd Century Alliance, to ensure that Coatesville’s second century as a Pennsylvania city of the third class be economically prosperous for its residents and businesses. For more information please visit www.2ndCenturyAlliance.org.